An "Anton Paar training laboratory" was recently opened at renowned VLB, the Research and Teaching Institute for Brewing in Berlin. 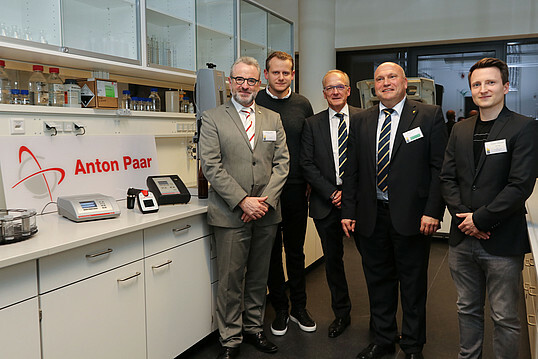 It is equipped with the latest analytical instruments, an investment that is much appreciated by VLB-president Ulrich Rust who explicitly thanked Anton Paar during his opening-speech. The training laboratory is part of the new institute building of VLB in Berlin. The opening-ceremony was attended by about 500 guests from the national and international brewing industry. Anton Paar's brewing expert Gebhard Sauseng represented Anton Paar at the event in Berlin. Anton Paar and VLB have been cooperating since many years. VLB is among the world’s leading competence centers for the brewing-, malting-, and beverages industry. It provides research, training, education and service for the brewing industry and has a history that goes back to the year 1883. Link to the VLB Berlin newsroom.